Gather 'round friends, today is one of your favorite days, a day where I share a story of a time that I did something really stupid and lived to tell the tale. Typically, I like to blame my rash or wayward decision making skills on baby brain or pregnancy hormones but today's tale takes us back to a darker time: when I was a Bride. A few weeks before my wedding day, I decided that I needed lash extensions to complete my bridal mug. I had recently learned that my make up artist would not be able to join us on the big day because she had be huffing something other than hairspray and neglected to add me to her work calendar (true story) and so I would be doing my own bridal face. Fueled by the panic only a Bride threatened with a bad photo can truly understand, I set off to watch every YouTube tutorial and buy every product that guaranteed a flawless or fool proof finish. As fate would have it, I received an email sharing the wonderful news that a brand new "lash studio" was opening in town. 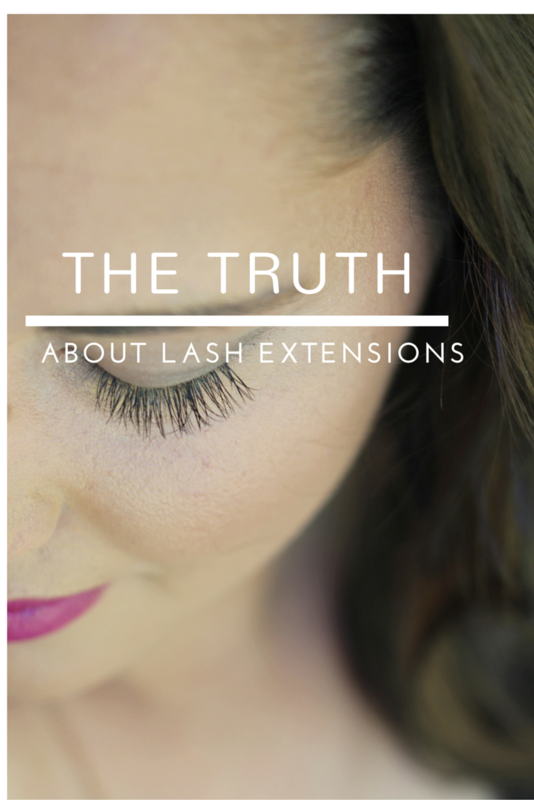 As lash extensions were relatively new to the general public at the time, this was big news. And, in even better news, the new joint was offering lash extensions at an extremely discounted rate - and I couldn't click Purchase quickly enough. And so off I went, the Tuesday of my wedding week to what turned out to be a small, basement room of a local "salon". Lashes were applied and I was a gorgeous, if not squinty, version of my former self. For a few hours. And then the pain set it. My eyes became so tender that they felt bruised and raw. My eyelids became too tender to touch - even my sunglasses were painful if the ends of my new lashes brushed against the lenses. My eyes, of course, became red and bloodshot and looked less like a blushing bride and more like the Bride of Frankenstein. As any normal person would do, I did a bit of Googling, hoping to find evidence that my symptoms would subside because we were already in the car, heading three states away for my wedding weekend. Thankfully, by my wedding day, the redness had cleared and while my lashes were still tender, they weren't painful, so I kept my extensions in tact, letting them naturally shed and certain I would never have extensions again. Lindsey is a local blogger and she and I ran out to grab coffee and chat all things blogging a few weeks ago. As a side gig, Lindsey also owns a super successful salon, Organic Tan, so I took it upon myself to ask her all sorts of amazingly professional questions like "how long is too long to go between bikini waxes". Somehow the topic of lash extensions came up and I told Lindsey how bummed I was that I couldn't have a set of my own because there is clearly something wrong with me that makes my lashes super sensitive. I wish you could have seen the look Lindsey gave me. She was quick to tell me that the reaction I had did not sound like a normal reaction and that she thought my first set of lashes had been applied improperly. She asked if the technician had any certifications (aesthetician, cosmetologist, even lash certified) and I had no idea - I hadn't thought to ask. She asked what type of lashes and glue were used - again, I hadn't thought to ask, and what sort of maintenance instructions I had been given - I hadn't been given any. At this point, I was starting to see the error of my ways and maybe a glimmer of hope that I could try again with new, glam lashes. Thankfully, Lindsey invited me to Organic Tan for a new set of lashes which would be applied by a lash certified cosmetologist. I couldn't say yes fast enough. A beauty product that allows me to roll out of bed and look put together? I am wearing zero eye make up in this photo, which is clearly filtered like crazy from SnapChat, and my eyes just pop. I am pleased to report that I had zero pain, tenderness or redness and, while the weight of the lashes takes a moment to get used to if you aren't used to wearing falsies (I'm not), absolutely no discomfort. I am all about anything that makes me look put together with minimal effort these days and the lashes honestly made me feel like my face was on point right out of the shower. I have never loved a beauty product so much, ever. Your lash technician should be happy to drop her credentials when you ask for them - he or she worked hard for them. If you are getting lashes for the first time and have never visited your studio of choice, swing by and make your appointment in person. That way, you'll be able to ask any questions you may have, check out credentials and snag any tips the salon has prior to your appointment (for example, I most likely would have worn eye make up to my appointment because it was at the end of the day - a major no no prior to application). If I had popped by the studio I used prior to my wedding day, I would have skipped that appointment and saved myself quite a bit of pain and worry. Prepare for your first appointment to last anywhere from one to two hours - depending on your desired lashes and natural lash thickness/length. My lashes were applied from the outside in, and Logan worked on a certain section of one eye, then switched to the other and mirrored the section to ensure the lashes were cohesive from side to side. Lash extensions shed with your natural lashes so maintenance is required every few weeks. Check with your salon to see what qualifies as a Fill In which runs at a lower rate than a full set. Organic Tan considers an appointment 2-3 weeks after your original set to be a Fill In, after that, you'll have shed most of your lashes and will need a full set. The lashes on the side of your face that you sleep on will fall out more quickly than your non-pillow side. There are certain eye masks you can rock that will help prevent rubbing from a pillow and extend your lash life. No regular mascara on those babies! You won't need it anyway! If, for some reason you do wish to wear mascara with your extensions, you will need to grab a tube from your lash salon - they have extension approved formulas - but seriously, you will not need any extra help once your lashes are applied. No scrubbing your eyes or lashes - be gentle with them, avoid getting them wet, don't rub them etc. and they'll last longer. Thank you to Organic Tan for hosting me, providing my first set of lashes and showing me the way it should be done! While I was provided a set of lashes, all opinions are my own including this one: everything Organic Tan does is top notch, from online booking to the staff, I have loved every second of working together. I have been wanting to get some, but I've heard a couple horror stories. Your post put me at ease -- and I can totally relate to panic mode as a bride! They look so gorgeous! I am a mascara addict so I'm not sure if I could put down my LashBlast for even a day. So glad your eyes were better for your wedding day! Gorgeous! do you know if your extensions were mink or silk?